I am constantly losing my keys. Either they get buried under a pile of gloves on our front table, or my two-year-old decides that they would be much safer wedged between the sofa cushions. And, it's always when I'm about to run out the door that I realize they have gone AWOL. 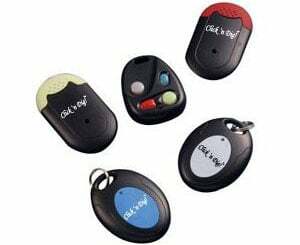 However lost keys, cell phones, wallets, TV remotes or whatever can be found quickly when you have a locator tag attached to them. For a basic model, check out the Click ‘n Dig! Key Finder ($37). 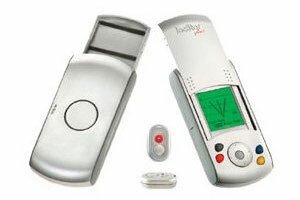 The system comes with two key-fob tags and two thin receiver tags that you can affix to items with double-sided tape. To find an item up to 60 feet away, you just press the colored button the matches your item’s tag and the tag will beep. On the high end, there’s the Loc8tor Plus ($170), which has a listed maximum range of 600 feet It comes with four tags, but is capable of tracking up to 24 items. When you select the tag you want to find on the receiver’s display you’ll see the direction and range of the tag as well as hear it. There’s also an Alert Mode, which will trigger an alarm as a tag moves outside a pre-set range. Of course the -maximum ranges for item locators reflect- ideal circumstances. If your keys are prone to being buried in the sofa cushions, like mine are, you can expect the range to be about half the listed distance. And if my two-year-old discovers the flushing down the toilet trick, all bets are off! oh wow, that sounds fantastic - I lose my keys so often in my house! I’d love to see a giveaway for this item!